The Bulldogs in San Diego group is committed to three goals: helping alumni and students build and maintain a bond with the University of Redlands, give back to the community, and develop professionally. The Bulldogs in San Diego alumni group recently held a special Bulldogs in Service event at the Chula Vista Marina, followed by a social and mixer at the nearby Living Coast Discovery Center. The two-fold program only served to give back to the community, but also brought students, alumni, and their families together for a fun and educational day. After some participants collected approximately 20 yards of trash from the bay front, about four dozen Bulldogs came together to network, catch up with old friends, and enjoy a taco lunch. The venue, Chula Vista’s Living Coast Discovery Center, is a hidden gem that is home to over 1,000 animals, with exhibits showcasing the marine and aviary wildlife native to the San Diego area. The Center also houses multiple rescued animals that are no longer able to survive in the wild. After lunch, several members of the Bulldogs in San Diego Alumni Board hosted two private wildlife encounters. The first was with a raptor, followed by an up-close-and-personal shark and ray feeding, with many of the U of R brave personally feeding the sharks and rays... by hand! The group had the rest of the day to take advantage of the Discovery Center's exhibits, local fauna and flora, the Turtle Lagoon, Raptor Row, the Shorebird Aviary, the Shark and Ray Experience, and several miles of walking trails along the pristine San Diego coastline. Many of the Redlands visitors were enthralled by the Center's magic, stating, "We never knew this was here!" 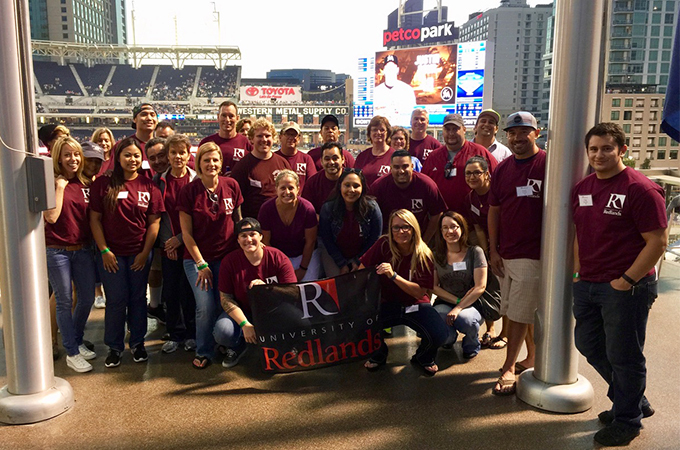 The Bulldogs in San Diego group is committed to three goals: helping alumni and students build and maintain a bond with the University of Redlands, give back to the community, and develop professionally. Led by Cary Attl ’14, core members include Elara Bowman ’16, Cathy Kear ’17, Bonnee Proo ’04, Nancy Soukhavong ’18, and me. Support is provided by Tom Bozman ’06, director of U of R’s San Diego and Temecula regional campuses, and the University's Alumni Relations team. Members of the Bulldogs in San Diego group stand together on the ice before a San Diego Gulls hockey game. 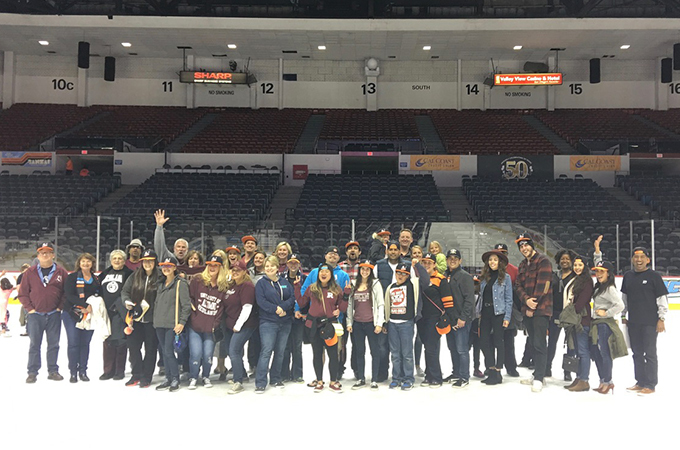 Other recent social events we have hosted include San Diego Gulls hockey games—complete with between-period-Zamboni-rides for Bulldogs—and Padres baseball. Alumni also meet regularly for social/networking events at various restaurants around San Diego, including Stone Brewery and the Soda and Swine Bistro in Point Loma. Before the bay cleanup, our most recent service event was staffing one of the water stations at the National Foundation for Autism Research (NFAR) Race for the Cure 5k run and walk at Balboa Park. With over 2,500 race participants, the group was busy keeping the runners, walkers, and their four-legged best friends hydrated! We have also conducted clean-up and maintenance at Noah Homes, a nonprofit group home for adults with intellectual and development disabilities, and contributed to Cuyamaca Community College's water conservation garden. As for professional development, in May we organized a workshop that detailed the operations and management of City Farmers, a small, local, family-owned business founded more than four decades ago. The workshop highlighted the strategies, challenges, ever-changing competitive landscape, succession planning, and rewards of running a small business in a competitive, big-box-store, urban environment. The Tall family—Bill Tall, patriarch and founder; Sam Tall, operations manager; and Rebecca Tall Brown, marketing manager—shared their experiences and insights with candor, humor, and humility. It was an incredibly insightful, and entertaining event. Bulldogs in San Diego aims to constantly lean forward in support of our alumni, our university, and its Forever Yours mission by keeping alumni active, engaged, and connected! Och Tamale!